Filed to: Btooom!Filed to: Btooom! Ryouta and Himeko are presented with a number of revelations about the game after one of Ryouta’s upperclassman appears on the island. Will Ryouta have what it takes to escape from the island with his humanity intact? Resolving their feelings for each other after narrowly escaping death at the hands of their companion Taira, Ryouta and Himeko continue to battle the odds to survive the death game. However, they are soon cornered by Ryouta’s former best friend Oda, who asks them to join him in escaping the island. Soon afterwards, Ryouta sees one of his former upperclassmen who now works as one of the maintainers of the game and is given information that could be the key to finally grasping the mystery of their predicament. BTOOOM! Vol. 10 continues to advance the story at a good pace, and I particularly enjoyed that we are finally given some answers about the nature of the game. These revelations were well timed considering the current storyline, and served to excite me about the direction to story will be continuing to take. Introducing Ryouta’s upperclassman into the mix was a good decision as I felt it gave us an interesting perspective on the events on the island from an outsider, and I’m hopeful that this will be used as a plot device in future volumes. One thing this volume did particularly well even in comparison to other volumes was deliver on character development, providing more depth to both our main and supporting characters. After Ryouta and Himeko finally confessed their feelings for each other in the previous volume, I was eager to see how their relationship would progress and I was not disappointed in this volume. I felt their relationship was handled quite well in the previous volume and this continues to be the case here as Inoue is able to create a number of subtle moments that build their relationship in a satisfying way. This provided an enjoyable and really tangible sense of character development for Ryouta as we really get to see him grow into a more confident and resolved character because of his new sense of responsibility to Himeko. This also affected his actions as a whole as he deals with his adversaries on the island, and it will be exciting to watch as he continues to develop as a character. While our protagonist got a good amount of character development in this volume, I also enjoyed the focus given to some of the supporting characters in this volume. In particular, recurring adversary Hidemi Kinoshita got a good portion of a chapter devoted to fleshing out her back character and I found this to be a good addition, building her character effectively. Hidemi was not a character I felt was particularly compelling in the series up until this point, but I found it notable that her backstory actually managed to make me sympathetic for her. In addition, this continued to emphasize that while some such as Ryouta could have deserved to be sent to the island, there is an inherent unfairness in the presence the backstories of Himeko and Hidemi. This has led to many interesting character arcs over the course of the series and I’m hopeful the Hidemi’s character arc continue to add to the story and pay off in a satisfying way. BTOOOM! as a series has always done a great job creating exciting action sequences and like I would expect, Vol. 10 continued to up the ante in this regard. Ryouta’s character development was a catalyst for this, as a battle against his repeated adversary Kira was one of the highlights of this volume. It would be tempting to dismiss Ryouta fighting Kira again as a bore since this is the third time they have had a confrontation in the series, but thanks to Ryouta’s new found confidence and resolve, the battle felt completely fresh and continually exciting. It was fantastic to finally see Ryouta at the height of his skill as a BTOOOM! player, and I’m really hopeful for future action scenes now that all of the players are fighting with a renewed sense of desperation. I don’t really have any complaints about this volume, it was well paced and delivered the character moments and action I would expect from this point in the series. I still feel that the character designs feel a little bit off during some stationary scenes, but the art continues to be fantastic during the action scenes and is more than enough to make up for that. BTOOOM! Vol. 10 is another very strong volume in the series, pushing the storyline ahead in a meaningful way while delivering the best and most exciting action sequence this series has seen so far. Fans who have been following the series will not be disappointed with this volume one bit, and this series is one that shows no signs of slowing down. Oddly enough, this volume feels like it might be the most logical place to start for new readers who want to jump in right away to the series as a number of the ongoing plotlines resolved in the previous volume, making this an accessible entry point. 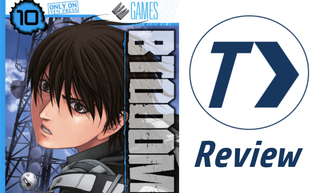 Whether you’re a currently following the series or new to it, BTOOOM! Vol. 10 can definitely be recommended and will be sure to please all. BTOOOM! Vol. 10 was published by Yen Press on May 23rd, 2015. Authored by Junya Inoue, the series originally began in 2009 and is still ongoing in Shinchosha’s Comic Bunch magazine. The series received a one season anime adaption in 2012 and volume 11 will be published in English on August 18, 2015.